The purpose of this experiment was to practice sensing the CSE and to compare two different CSE systems. 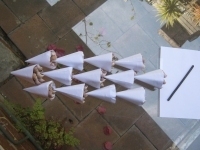 In the picture are 13 paper cones, each containing 7 Turritella terebra seashells in hexagonal shape. The cones are aligned away from the Sun. By gently sensing with a drawing coal, subtle repulsive layers were perceived. Sometimes they were surprisingly noticeable for a few seconds, and in other times sensing of these layers disappeared. 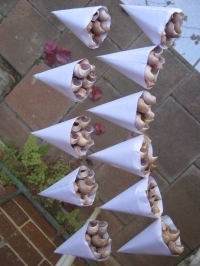 Here is another setup with 11 paper cones, each containing 7 seashells in hexagonal shape. The second row is about 10 cm from the first row. This concave setup created much stronger CSE layers that were about 1 cm thick and located at the distances of 5cm, 10cm, 15cm, 20cm, 60cm, and 120cm from the seashells. These experiments were made in Sydney, Australia, on December 2009. The spiral diameter grows ≈ 1.17 times by every loop, corresponding 1.618 times growth by every third loop. The cone angle is about 13.5° and equivalent to Constable's etheric weather engineering cone angle (Mark 5 Spider). The center cut reveals inner cavity structure. There is only one cavity, but due to spiral curvature the center cut has many cavities. The perceived CSE from previous seashell systems imply that CSE is multiplied in spiral cavities. Grooves on the outside edge of the seashell could contribute to the total CSE. In addition to growth spiral main groove, there are 5 little grooves on the growth spiral. 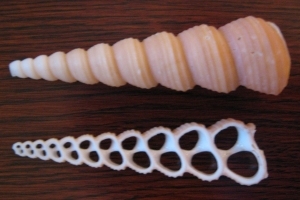 As one seashell makes 10+ loops, the number of grooves and cavities multiplies. Update (February 1, 2011) The diameter of the cavity grows from ≈ 1 mm to 10 mm. The calculated matter wave frequencies correspond from 182 Hz to 1.82 Hz (using free electrons effective mass). As an example, 1 mm diameter cavity produces matter wave frequency of 182 Hz and wave maximums to the distances of 1, 3, 5, 10, 20, 40, 80 cm and so on. Theoretically there are many wave harmonics due to smooth widening of the seashell cavities. Maybe only two wave harmonics (from 1 mm and 1.5 mm resonant cavities) were detected due to experimenter's individual tuning capabilities and limitations of the detector instrument. Or could there be some kind of effect in conical spiral cavities that intensify certain frequencies? It is possible that the seashell cavities rhythmical location in space (see center cut) intensified two frequencies. At least properly phased cavities produce matter waves in phase i.e. coherent matter waves. 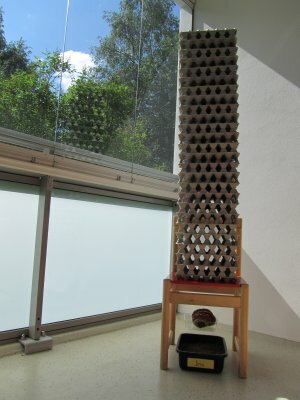 This experiment was inspired by Viktor Grebennikov's notebook of a naturalist and its purpose is to confirm the existence of the CSE with artificial honeycomb and a wasp nest. The wasp nest is aligned from West to East direction just for curiosity, since according to Reich (1954) & Constable (1990) Earth has basic West to East ether flow. Grebennikov (1991) also aligned his large cones (with magnets) along the West-East direction. 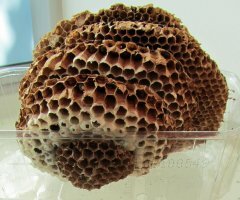 The wasp nest has 4 layers and between the layers are air gaps that are approximately 0.618 times the thickness of the thinner layer. The cell size (4.3 mm to 6.4 mm) and layer thickness (10 mm to 18 mm) grow towards the apex of the comb. The wasp nest produced excess salivation, slight numbness and nausea when handled and directed towards researcher. Below the artificial honeycomb seeds of oat (Avena sativa) are planted. As a comparison identical growing conditions are conducted 2 meters away from the combs. It seems that matter wave emanations from multicellular egg case structure and a wasp nest inhibits the growth of oat, as expected from Grebennikov's experiments.